Fake plug earrings are made to deceive the viewer by looking like stretchers, tapers and even real plugs. The many different fake plugs we sell fit through standard pierced ear holes and come in many different models. All models are in stock and sold individually. We sell a varied selection of fake plugs designed to give the impression that they are anything but regular earrings. A fake plug is therefore an opportunity to try out a new look prior to investing time and money with those more demanding jewellery items. Our fake plugs are intended primarily for men but are actually unisex. The range of colours we offer are not limited to black and white, with our collection containing a full spectrum of colours to choose from. According to EU legislation there must be less than 0.5 micrograms released per square cm per week for a product to be deemed nickel-free; all of our earrings meet that EU standard. We have quite a selection of wood and sterling silver earrings for anyone who has high sensitivity to nickel. 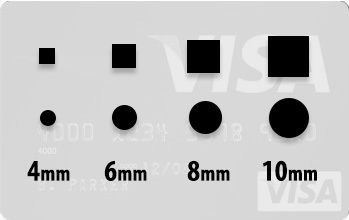 You can see the image below that indicates the relative size of the earring width when compared to a regular credit card.